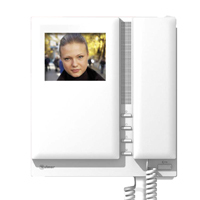 At SeriousCCTV, we pride ourselves as providers of the most reliable, flexible and cost effective intercom systems anywhere. We do not hype when we say the intercom security solutions we offer have satisfied our customers for many years and out intention is to keep our records straight and clean. Our foremost concern is in providing the most effective and updated intercom system for all premises including apartments or condominiums. In doing so we provide apartment owners and occupants alike to relax and enjoy the comfort of their stay in safety. 1280/AL eight push buttons grille module. Intercom systems don’t simply get delivered to your front door without other process involvement and this applies also to intercom systems for apartment blocks, condos and hotels. Procuring the right type of intercom involves the assistance of experts in firstly identifying a suitable source like SeriousCCTV, and in selecting the right type of system. 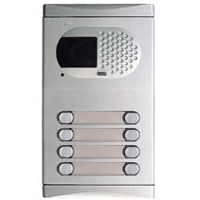 There are many types of intercom systems that can cater for your specific needs. If your main issue is people coming in to visit without the consent of the occupant, a wired or wireless intercom system with speakers would be ideal. The main purpose of an apartment intercom system is to identify who the visitor is and to determine whether or not to comply with a request to enter the block of flats. In some cases, it has happened that some visitors have used names falsely to gain entry and while some have been stopped due to the occupants of the visitor’s voice over the intercom, some have succeeded in gaining entry. In that case, connecting the intercom to a CCTV surveillance system will provide a positive identification of the visitor and put the required action into motion that would either permit or refuse entrance. The familiarity of occupants with the operation of an intercom system is essential if security for the apartments is the main objective. At SeriousCCTV we are intimately acquainted with the functions of an intercom system and in addition to our assistance in identifying and selecting the ideal system for you, we can also leave directions as to the use of the system in clear print near the mouth piece of the intercom system for user reference and action. This will ensure that users become familiar with how the system works thereby enhancing their security during their stay. Having the proper intercom system installed in your block of apartments is an essential ingredient for security. Ring us now on (02) 8091 1989 for a free quote and see how we can identify, select and install the system for you.